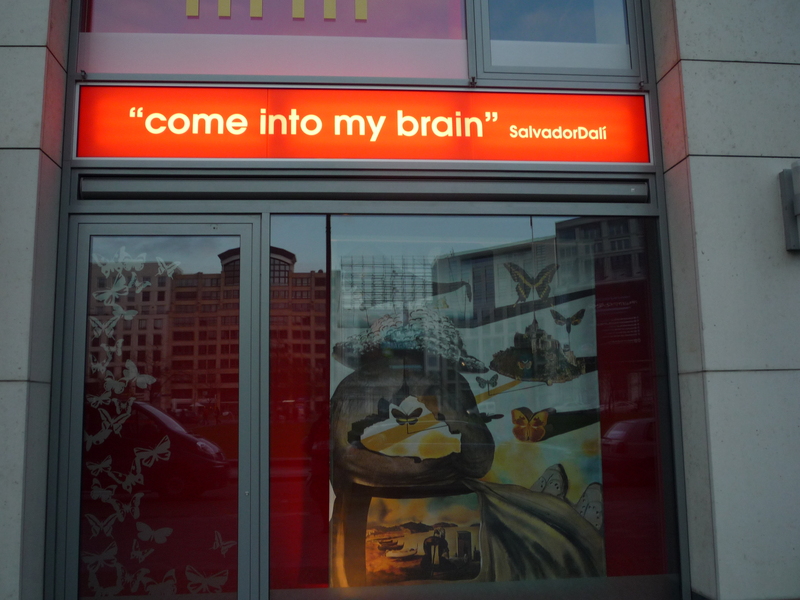 “Berlin is the newest city I have come across”. Since we have only 2 days to visit the city and a lot of places to see, let’s get ready for a big walk…so don’t wake up late on Day 1! The best way to optimize your time is to start from the East side and go to the West. 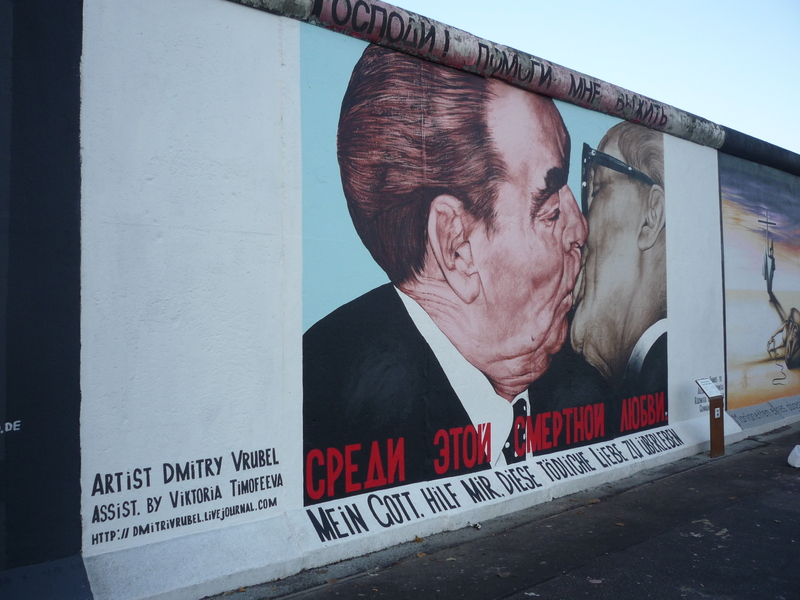 East Side Gallery (Berlin Wall): this is the largest open air gallery in the world. It stretches from Ostbahnhof station to the Oberbaumbrücke. 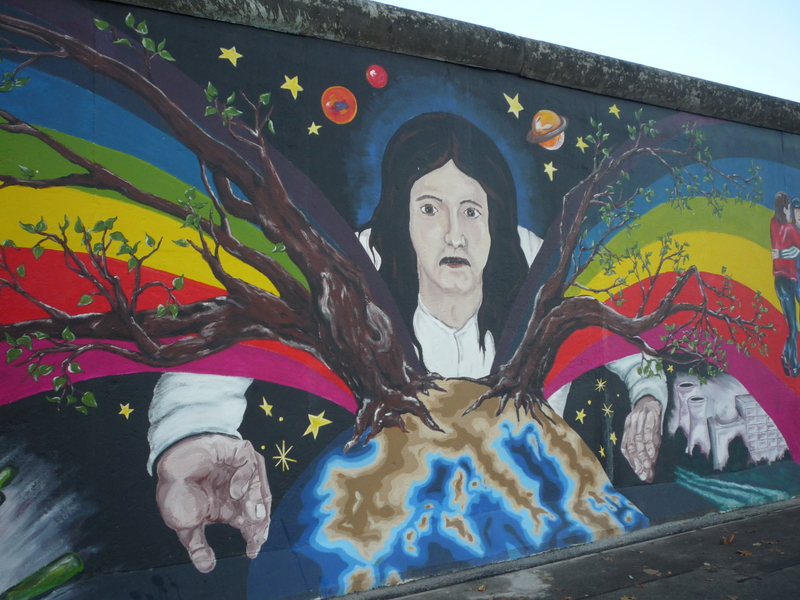 118 artists from 21 countries have painted several pictures on a 1,316 meter long section of the Berlin Wall, which is now a listed landmark. In 2009 the popular paintings, whose condition had deteriorated considerably in the last few years, were restored. 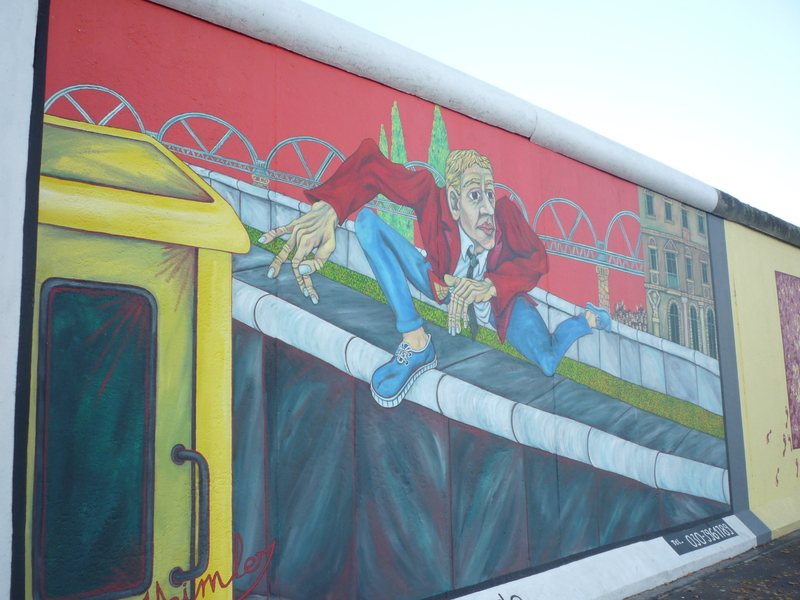 From the East Side Gallery, take one of the S-bahn mentioned above and get off at Alexanderplatz. Originally, this square laid just beyond the gates to the city. It received its current name on the occasion of the visit of Czar Alexander I. in 1805. Now the big place is very known for its stores, the World Time Clock, the Fountain of International Friendship and most of all for its TV Tower, visible everywhere in the city. Rathaus: just on the left side of Alexanderplatz is the Rathaus, the Berlin Town Hall, now the official seat of the mayor of Berlin. Because of its color, the imposing building is known colloquially as the “Rotes Rathaus” or “Red Town Hall”. 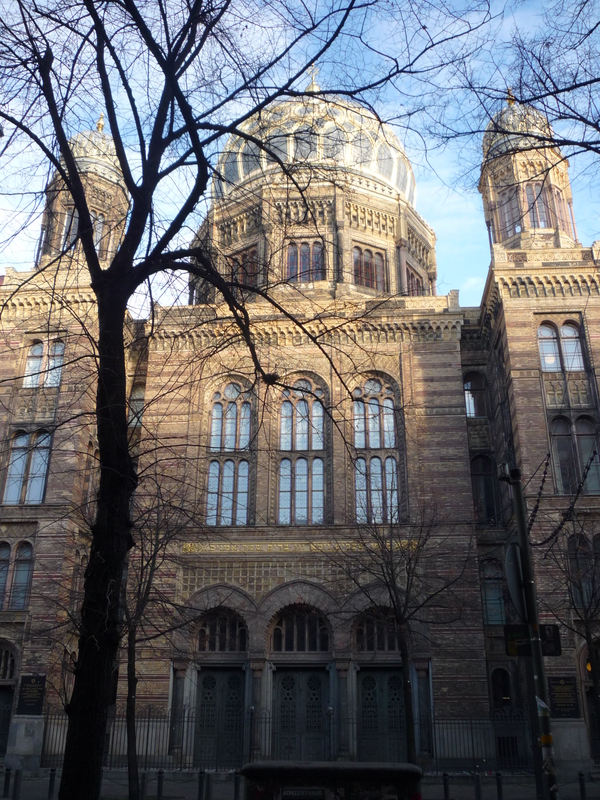 Museums area: just opposite the Rathaus, the Museums area begins. It starts with the Dom (the main church of the city) and it goes on with several interesting museums. One that you cannot miss is the Pergamon museum, with its magnificent art from Greece, Rome, Babylon and Middle East. The museum is open everyday from 10:00 to 18:00 and on Thursday till night. Sinagogue: from the Museum area, keep on following the river and then you will be arriving in front of the Sinagogue, a wonderful building, as beautiful as the rest of the area. Friedrichstrasse and Checkpoint Charlie: Friedrichstrasse is a very elegant street, with historical buildings everywhere. At the end of Friedrichstr., after having crossed Unter Den Linden, you will run into the Checkpoint Charlie, the best known border-crossing of Cold War days. The sign, which became a symbol of the division of Cold War Berlin and read like a dire warning to those about to venture beyond the Wall – YOU ARE NOW LEAVING THE AMERICAN SECTOR – in English, Russian, French and German – stood here. It is today an iconic marker of territorial boundary and political division. 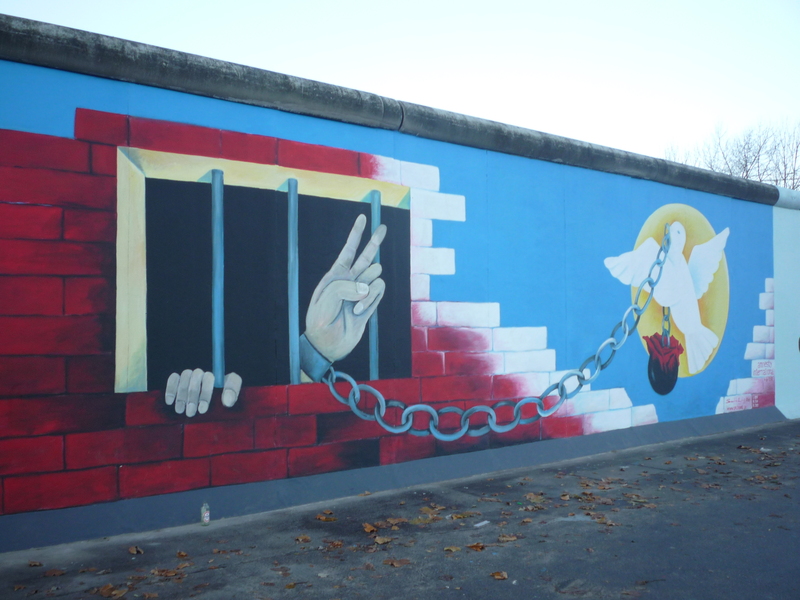 Until the fall of the Berlin Wall on November 9, 1989, it signified the border between West and East, Capitalism and Communism, freedom and confinement. 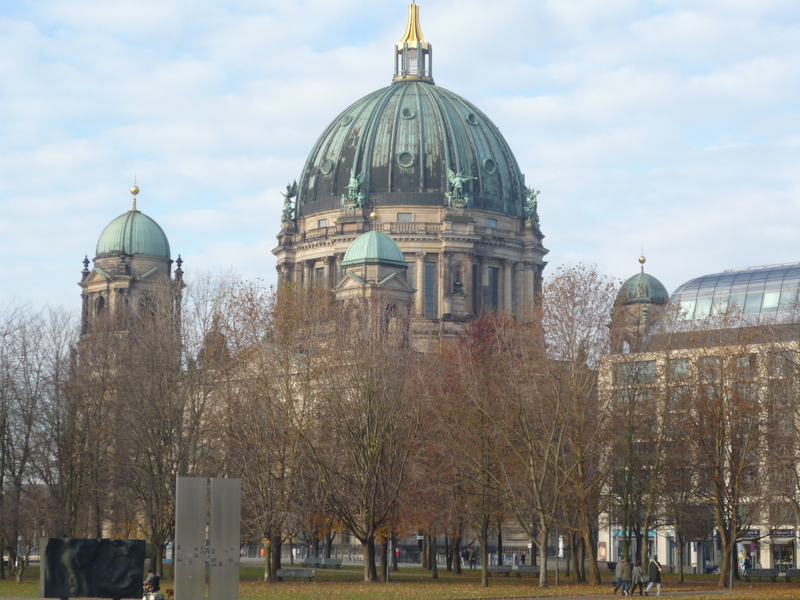 Unter den Linden: This is a huge street, plenty of shops, offices and historical buildings and museums (for instance the Guggenheim and Madame Tussaud are there). Brandenburger Tor: at the end of Unter Den Linden you will arrive in front of the Brandenburg Gate, Berlin’s only remaining city gate, the true symbol of the city. The sandstone construction has 12 Doric columns and is based on the propylaeum of the Acropolis in Athens. 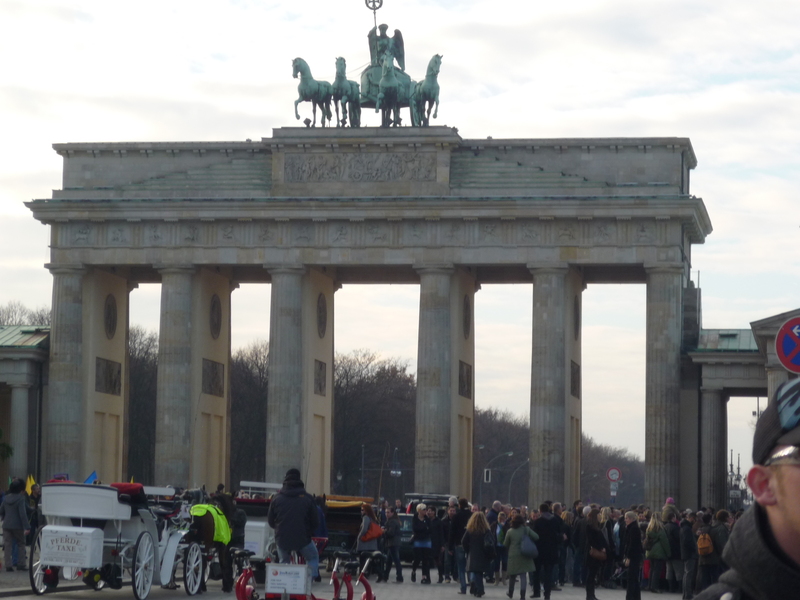 After the decision of Berlin’s senate on October 22, 2002 Brandenburg Gate remains closed for cars, cabs and buses. Berliners and their guests can enjoy now the renewed beauty of the Pariser Platz. Just next to the Brandenburg Gate is the magnificent Reichstag, the Parliament building, where you can go up and admire the amazing view of the city. 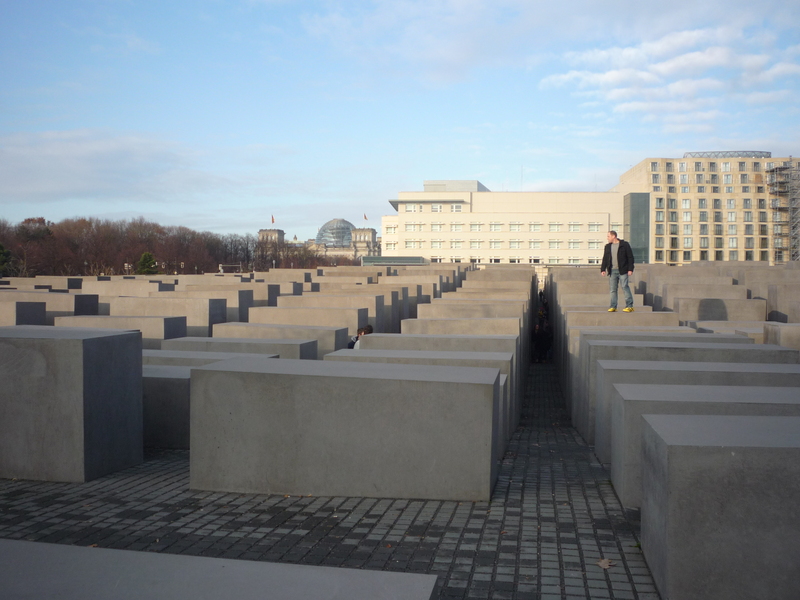 Holocaust Memorial: once you cross the Brandenburg Gate go on the left and you will arrive in front of the Holocaust memorial. It consists in 2711 cement blocks of different heights, where you can walk and get lost in it. From Cora Berliner str. you can then enter in the underground Ort der Information, an exhibition on the persecution of Jewish with several documentation. 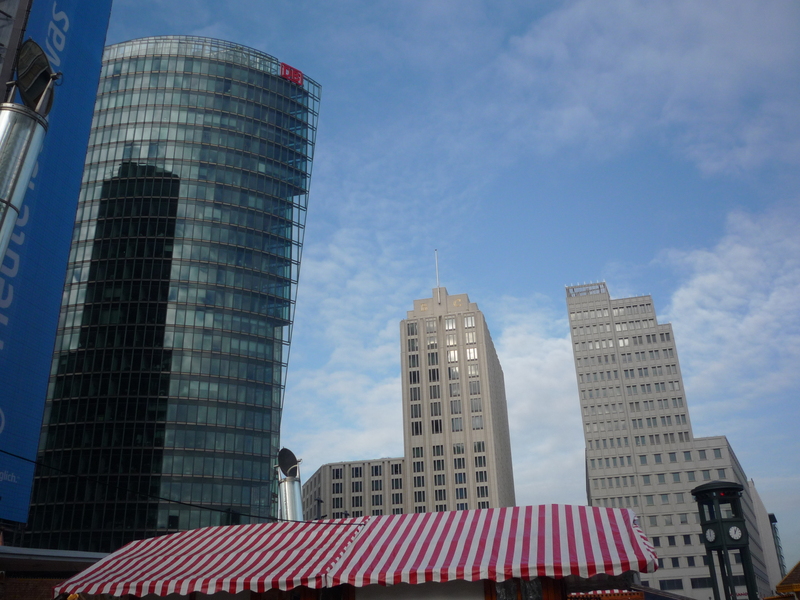 Potsdamer Platz: Potsdamer Platz is one of the most popular attractions of the New Berlin. 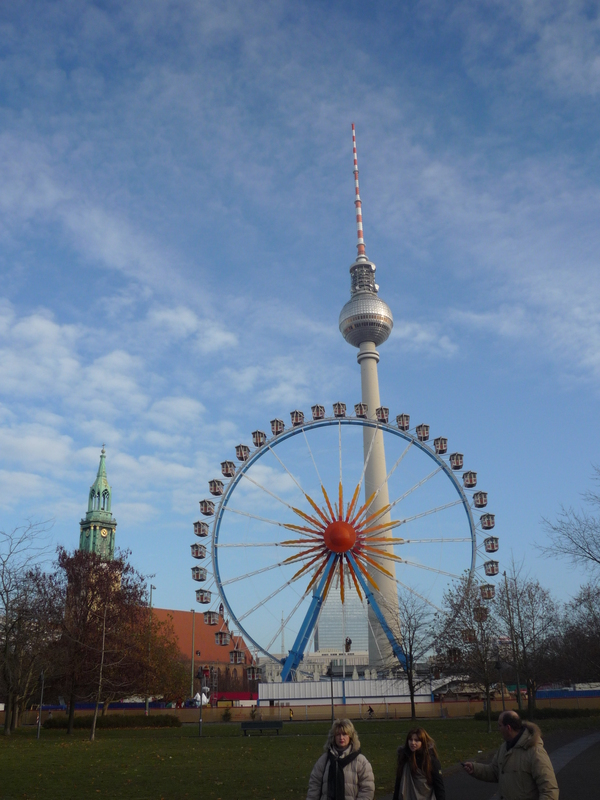 With its mix of restaurants, shopping opportunities, theater and cinemas, both Berliners and tourists can enjoy their time over there. The place is full of office buildings, shops, hotels, apartments and restaurants as well as the Theater am Potsdamer Platz and a casino. The 22-story debis-Haus was designed by Renzo Piano: its atrium, boasting cathedral-like dimensions, contains Jean Tinguely’s machine sculpture “Meta-Maxi”. Next to this are the Potsdamer Platz Arkaden – a big shopping mall. In 2000, the Sony Center opened on Kemperplatz. Seven buildings surround the forum, which is conceived as a light-flooded arena with a tented roof. The futuristic building also houses the Filmhaus with the Filmmuseum, the cinemas Arsenal and CineStar and an IMAX film theatre, as well as restaurants. The complex of hotels, offices and residential units reminds of early modern American skyscrapers. After the big rush of day 1 it is time to relax and give some space to the culture and fun. Zoological Garden: The zoological garden, one of the largest in the world, is among the most important sights in the city. It is now the most important animal collections in the world, with around 19,000 animals and some 1,400 different species. There is a beast of prey house, a hippo house and a nocturnal animal house, and the largest aviary in Europe. The aquarium is one of the largest in the world and has the largest number of species of any in Europe. Visitors can either enter the zoo through the Elephant Gate beside the aquarium in Budapester Straße, or through the Lion Gate on Hardenbergplatz, directly at Bahnhof Zoologischer Garten. How to get there: Line S5, S7, or S9, stop “Zoologischer Garten”. 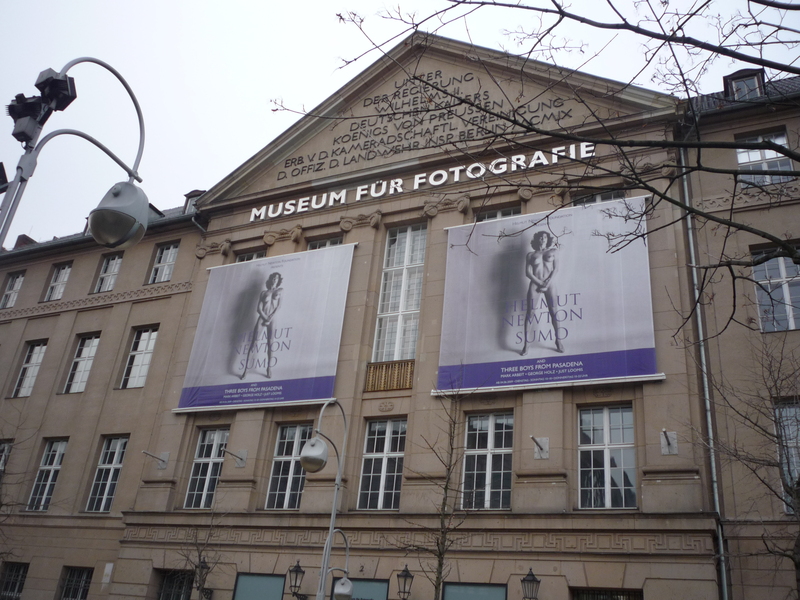 Museum of Photography and Helmut Newton Museum : Located just in front of the Zoological Garden, the museum presents changing exhibitions on the life and work of Helmut Newton, one of the most important fashion and portrait photographers of the 20th century. Newton loaned a vast collection of photographs to the museum for exhibition. The Kaisersaal of the Museum of Photography displays installations by contemporary photographers and artists. The museum is open from 10:00 to 18:00. After the visit at the Zoo and the Museum, depending on the time you have left you can do other activities. You can for instance postpone some Day 1 activities to Day 2 (e.g. have Pergamon museum, Guggenheim and Holocaust Memorial on Day 2, so that you have one day of sightseeing and another day of museums), or do some shopping, or have a nice tour in the East side of the cit (totally different from the West one, but in continuous evolution, especially from the cultural and artistic point of view).